With eTutorWorld’s qualified expert math tutors, students learn math in innovative ways. Gift your child the eTutorWorld advantage and watch them master these valuable skills as also have the confidence required to succeed in grade school and beyond. Let your child learn from our highly experienced math tutors for all grades 3 to 12. Tutoring is not all we do – our tutors offer valuable assistance with homework help, assignment help, and test prep as also guided mentoring as needed. Connect with one today! Prime factorization of a whole number means to write it as the product of only prime numbers. A composite number can be written as a product of all of its prime factors. Divide the number by prime factors until the quotient is 1. What is the prime factorization of 45? Another method for producing the prime factorization of a natural number is to use what is called a factor tree. The first step in making a factor tree is to find a pair of factors whose product is the number that we are factoring. 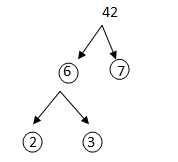 These two factors are the first branching in the factor tree. There are often several different pairs of factors that we could choose to begin the process. The choice does not matter; we may begin with any two factors. We repeat the process with each factor until each branch of the tree ends in a prime. Then the prime factorization is complete. So the prime factorization of 24 is 24 = 2 ×2 ×2 × 3 = 23 × 3. What is the prime factorization of 86? What is the prime factorization of 592? What is the prime factorization of 225? What is the prime factorization of 1050?